In recent years Japanese food has become very popular abroad.In 2013, washoku (Japanese food) was designated an Intangible Cultural Heritage by UNESCO.Since, Japanese food has become known to even morepeople of the world. Domestic knives are indispensable to Japanese food. 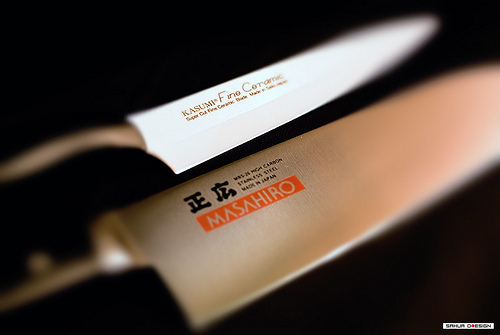 But did you know that Japanese knives are also becoming indispensable to overseas chefs? The popularity resides in its sharpness! Japanese knieves are considerably sharper and lasts longer than those made anywhere else in the world. 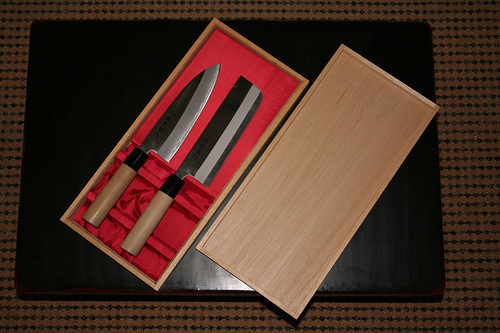 Why do Japanese kitchen knives have such high performance? The difference lies in the way knives are perceived in Japan versus the rest of the world. Japanese artisans focus on the hardness of metal in order to maximize its sharpness and longevity. The Japanese use a stone to sharpening knives, called Toishi. When the blade dulls, the knife is sharpened and resharpened against this toishi to maintain its sharpness. Why was the difference in thought then? The cultural difference is said to have originated from the difference in physical stature between Japanese and foreigners. Japanese have historically been smaller and physically weaker, and relied on the sharpness of their tools. In contrast, Anglos were larger in stature and stronger, and sought different traits in their weapons: more weight for a guaranteed kill; flexibility for increased maneuverability; and a robust, rust-proof blade. The difference in diet also laid the foundation for this cultural gap. Fish and vegetables constituted the bulk of the Japanese diet from ancient times. Even if the blade were hardened, fishbone posed less of a risk in chipping the blade of a knife than animal bone. Recently Japanese kitchen knives are becoming popular not only among chefs, but among the general public, thanks to this video. Please click to view!